Wash the wheels, tires, and wheel wells first! Since I am the owner of a 2007 Acura TL Type S in Nighthawk Black Pearl (NBP), I get asked a lot of questions from Acura owners (and owners of black cars in general) on the proper car and maintenance and how to keep them looking their best. NBP is a very challenging paint to care for to say the least, but if you combine the proper detailing techniques and products, you can keep it looking absolutely beautiful. Acura/Honda paint is soft and therefore it’s easy to scratch, mar, and swirl the finish. And since NBP is black, every little flaw stands out where it could be difficult to detect on a lighter color. Fortunately though, Acura/Honda paint is relatively easy to correct by machine polishing. Like I mentioned already, I have a NBP TL-S that I’ve owned for 2 1/2 years now, and it is my test vehicle for all products. I am continuously trying different products and techniques to see which achieve the greatest results. In 2 1/2 years of ownership…that’s a lot of testing to see what works best on NBP! So as you read through this article, you can be assured that any recommendations I provide are based on countless hours of trials and field testing with my own personal NBP Acura TL. I don’t mean to come across as brash, but I do consider myself to be a bit of an expert on this one! Here are a few photos of the results I’ve been able to achieve on the official test vehicle. My plan is to write this article a bit differently than what I usually do. I am going to specifically address techniques, procedures, and products for the NBP Acura paint, as well as areas of concern on the TL. Having said that though, these techniques can be used on any color/manufacturer of paint. If you can follow instructions for a challenging color like NBP, then you can be assured that it will work on yours. The ultimate goal of this article is to create a detailing reference of sorts for Acura owners. The owner of this particular TL had seen some of my work, and contacted me about a consultation to see what we could do to correct some problems and take the finish to a new level. When he found out that I owned a NBP TL-S, he knew that I was the right person for the job. One interesting note is that he’s an engineer for American Honda here in Ohio, and was part of the design/development team for this particular model. Although he’s taken pretty good care of it over the years, it had its fair share of scrapes, swirls, and bumps and bruises. The biggest issue he was concerned with was a stain on the trunk lid from milk…more on that later. Because of all the fine scratches and swirls, the finish looked a bit dull, and the blue flake that owners of NBP love so much was quite muted. I knew that leveling the clear coat and then jewelling it with an ultra-fine polish would restore it to its original beauty (or better). When the car arrived it was cloudy out, so I was unable to get any good “before” photos in the sunshine to show the level of swirls and defects in the paint. I had to settle for some shots with the flash, and with an inspection light, but you’ll be able to get a good idea of what I was dealing with. First up are the lower rocker panels. This is a problem area with most cars, but they get exceptionally bad on the TL. They are very easily scratched, and get abused by road debris and from shoes/legs while getting in and out of the car. Since they get so dirty, it’s easily to scratch them up during the wash process as well. The finish on these was so bad that there was no reflectivity or depth whatsoever. They also had a lot of very deep vertical scratches (from shoes) and I knew they would be too deep to fully correct. The areas around the door handles were in rough condition as well. You need to keep rings, keys, and long fingernails away from the paint otherwise you’ll end up with this. When opening and closing the door, always (lightly) use the handle…don’t grab the door to close it. I even have my 9-year old trained to use this method, and the door he always gets in and out of remains completely scratch free. This is the rear door, and these types of scratches are usually a good indicator that somebody has been closing the door by pushing/sliding against it instead of using the handle. If you have friends/family regularly getting in and out of your car, kindly ask that they use the handle and not to touch the painted surfaces. Sure they’ll think that you have serious OCD issues, but your paint will remain in good condition and you will maintain a higher resale value as a result. And here’s the infamous milk stain on the trunk lid that I was telling you about. The owner had set his son’s sippy cup of milk there and it managed to get on the finish. You can see the ring where the cup was, and then where it started to run off of the back. I’m not sure how long it set on the surface, but this stain wasn’t coming off easily. So another important safety tip…never put anything on the surface of your car. No coffee mugs, no gear bags, no purses, and no briefcases because it WILL cause damage! And never, ever lean against or sit on a car otherwise you’ll be coming to visit me to fix it. Paint really does damage that easily. Here’s a nice scrape that went down the entire length of the car courtesy of somebody’s suitcase. This is exactly why I always park as far away from other cars as possible at places where “stuff” is being carried…the airport, grocery store, the gym, or at the mall. There were scuffs just about everywhere on the car where there were edges or high spots. This is the front fender. This area in particular can get scraped up (just like this) when having your oil changed. You know those “protective mats” they place on your fender when they lean into your engine compartment? Well those typically have been on every filthy car in town, never washed, and then dragged across the surface of your car when they’re removed. That would be equivalent to rubbing sandpaper on the paint. It’s best to clean your car (yourself…the proper way) before having your oil changed, and then ask them to use a clean mat with extra caution when they put it on and take it off. Now that you’ve got a good idea of the condition of the car, as well as a few lessons in what causes this, let’s get into the work. The first step here is to fully wash the TL and to remove any contaminants from the surface prior to polishing. Since most swirls come from improper washing and drying techniques, and they’re especially noticeable on NBP, I will go into details on the washing and drying process so you can work on your technique a bit. When I am polishing a car, I always start off by removing the front and rear license plates so I can clean and polish those areas as well. Most of the time they’re simply in the way (like on the front of the TL), so it’s easier to take them off then to work around them. If you’re just performing a simple wash, then this step is not necessary. Here’s another important safety tip for when you’re cleaning/working on your car…remove all your jewelry! All it takes is one little bump with jewelry against the finish, and you have a big ugly scratch. Now you’re ready to prepare your wash buckets. Yes, that was plural, as in more than one bucket! Ultimately you want 3 buckets. One is your wash bucket, one is your rinse bucket, and one is dedicated for wheel cleaning. You could get away with just two, but then you’d have to stop and clean out a bucket after you finish your wheels before you started on the rest of the car. Notice too that I use Grit Guards in both my rinse bucket and my wash bucket. For the rinse bucket in particular, this helps dislodge dirt and debris from the wash mitt, and then keeps the sediment at the bottom where it is away from the cleaner water at the top. I put one in my wash bucket as well for added safety. The reason you need a rinse bucket is because you want the water in your wash bucket to remain clean throughout the entire process. If you use just one bucket that means you’re introducing dirt into your wash water, then using that same dirt to wash your car with…hence all the swirls! For more information on this, please refer to this handy Detailing Guide on Washing and Drying. When using your car wash soap, be sure to follow the manufacturers’ instructions on how much to use and measure accordingly. If you’re performing a maintenance wash, and use too strong of a ratio (more is not always better), then you may end up stripping all of the wax off of the car. Since I’m going to be polishing, I want to make sure that any existing wax is removed so I am using Chemical Guys Citrus Wash & Clear at paint prep ratio (2oz/gal). For my maintenance washes on my NBP TL-S, I use Dodo Juice Born To Be Mild soap. It’s very gentle, provides a tremendous amount of lubricity, leaves no soapy residue, and it smells nice too. Now my buckets are ready…red for rinse (both start with R…easy to remember! ), blue for wash, and green for wheels. Since the wheels and wheel wells are the dirtiest part of the car, it’s best to start with them first. If you save them for last, you risk getting very dirty overspray on your clean paint. First I’ll pre-soak the rims with P21S Gel Wheel Cleaner. This pH neutral product is safe for all wheel types, and it does a great job on heavily soiled rims. Just spray it onto both the face and the inner barrels of the rims, and then let it dwell for a few minutes so it can start to break down the grime. If you keep your wheels well maintained, you won’t need to use this all the time…just when the dirt and brake dust buildup has gotten bad. Next step is to apply an all-purpose cleaner to the tires and wheel wells. Here I am using Optimum Power Clean, but I also use Chemical Guys Grime Reaper as well. Now take your E-Z Detail brush and clean the wheel well areas. With all of the wheel cleaning steps, you want to thoroughly rinse out your wash media before putting it back into your wheel-wash bucket. Otherwise by the time you get to the last wheel you’d be washing it with mud. You can use a generic brush to scrub the tires. Notice how much dirt is coming off of them. 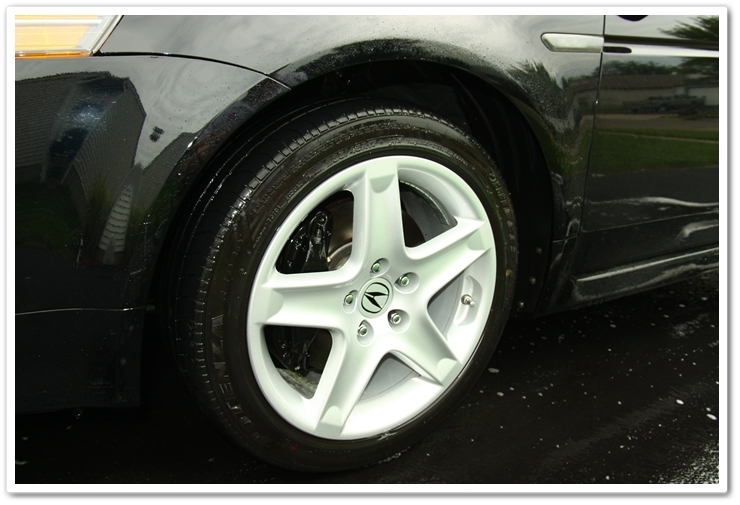 When they’re completely clean it will help the tire dressing to adhere better and provide a more uniform finish. Make sure you have a dedicated wash mitt or sponge for wheels, and don’t use them on the painted surfaces. Now you can use your Mini E-Z Detail brush to clean the inner barrels and brake calipers. You can also bend the tip of it to get behind the spokes. On your TL (and most other luxury brands), you’ll find a sound deadening fabric lining the wheel wells on the rear of the car. These are great traps for dirt, rocks, grass, and everything else that you run over on the roads. Simply spray these down with your all-purpose cleaner, and then thoroughly rinse them out with a strong stream of water. For more detailed information on wheel, tire, and wheel well cleaning, please refer to my Wheel Cleaning Tutorial. Okay, we’re done with the wheels, so we can set the wheel bucket aside and move on to the painted surfaces. Since the lower part of the doors and rockers are typically the dirtiest, I will pre-rinse them to remove and loosen up as much of the dirt as possible. The more dirt you remove prior to washing, the less the chances are of scratching your finish. Now I’ll move on to a few areas that require some special attention, and ones that are often overlooked. For these areas I use another product that is safe for all kinds of finishes…P21S Total Auto Wash. Don’t use any harsh cleaners because they can stain plastic or paint. When in doubt, read the product label. The front end of the car catches all of the nastiest stuff, so be sure to thoroughly clean out the emblem and the grills. Spray on some P21S TAW, agitate with a soft brush, and rinse off. When was the last time you cleaned inside your fuel-fill area? It gets dirty too, so don’t neglect it. Once again, P21S TAW is your friend here. If your door jambs have more than a light dust buildup, then you can use the same process in here. When rinsing off, just use an extremely light spray of water, and keep the nozzle very close otherwise you’ll soak the interior and door panel of your car. I realize that most people don’t own a Foam Gun, but I find it to be a tremendous tool for fighting the battle against wash-induced swirls. You just put your car shampoo in the bottle, attach it to the hose (it comes with a quick disconnect), and thoroughly pre-soak the vehicle in suds. This will further help to break down the dirt and debris, and will provide plenty of lubrication to help float away the dirt from the surface. The more gentle the process, the better the chances are of keeping your NBP looking its best. I usually let the foam dwell on the surface for a few minutes first. Now I’m ready to start washing. You want to make sure you’re using a very soft wash mitt otherwise, you guessed it, you’ll induce swirls! I have found the DI sheepskin wash mitt to be a proven winner for safe washing. I will do only small sections at a time (i.e. half the hood, a fender), and then completely rinse out the wash mitt before moving on to the next section. Remember you’re using little to no pressure at all. I always start with the top horizontal surfaces first, and work my way down. After one small section, dip your wash media into the rinse bucket and gently rub it against the Grit Guard at the bottom to loosen any dirt and debris. This is a critical step in keeping a defect-free finish. Your wash mitt is now clean, and ready to be dipped into your wash bucket. Once again, when you’re done washing the vehicle, your wash bucket should be as clean as when you started. For the sides of the car, I’ll first wash the upper portion with my wash mitt..
…and then I’ll use a separate wash media, such as the Lake Country grout sponge, for the dirtier, lower parts. Don’t forget to clean up under here…especially if your TL has a backup camera like my Type S does. Chances are that your exhaust tips are looking bad too. Here I’ll use Chemical Guys Grime Reaper, and then scrub it with my Mini E-Z Detail Brush. For a complete step-by-step guide, please refer to my tutorial on Exhaust Tip Cleaning. Your engine doesn’t need to be cleaned all of the time, but it’s worthwhile to go in and clean it every now and again. Once again my choice of cleaners is P21S TAW. Here you have to be careful, because if you use a strong cleaner, you risk staining plastic components, or worse yet your paint. Be safe and use a gentle cleaner. I’ll spray everything down (including the underside of the hood), and then clean it with an assortment of brushes and sponges. For a complete step-by-step guide, please refer to my tutorial on Engine Bay Cleaning. We’re done with the wash process now, so let’s move on to the proper way to dry it to keep from marring the finish. Just because you’re armed with some microfiber towels it doesn’t mean that you’re not going to induce swirls in the soft Acura paint. You also need to have the right kind of microfiber, and care for it properly as well. You have to use a very high quality microfiber towel, and use light pressure. The first thing I do after washing (always in the shade…especially on dark colored vehicles), is pull the car back in the garage and blow off all of the standing water, and water that hides in all of the cracks and crevices. The less you have to touch the vehicle the better. You could use a product like the Metro Vac ‘n Blo, or compressed air. If you don’t have access to one of these, then don’t worry because you can still get it done the old fashioned way. When you do your final rinse on the car, it’s best to take the spray nozzle off of the hose so that the steady flow of water creates a sheeting action. This will minimize the droplets of water which will help prevent water spots. Now that you’re ready to dry it off, first take a waffle-weave micro fiber towel, and gently drag it across the finish to remove the majority of the water. This will leave a little bit of water on the finish, and you want to get that wiped down to avoid streaking. If you just buff that out with a plush, dry microfiber, you still run the risk of marring the finish. For this step, you want to add some lubrication and the best method I have found on my NBP TL-S is to lightly spray either some Optimum Instant Detailer or Optimum Spray Wax onto the still-damp surface. Finally you want to take your plush, clean towel (here I am using the DI Great White), and very gently buff the surface with little to no pressure. Depending on how wet the surface was with water and detailer/spray wax, you may have to wipe it down, and then use a second towel for a final buffing. Once again, you’re using little to no pressure. With this proven method, you should have no streaks or water spots, and you’ll be left with a beautiful finish. It also saves time since you’re doing the drying and waxing/quick detailing at the same time. If you follow those key steps in washing and drying, you should be able to keep your NBP TL (or whatever else you may be driving) looking its absolute best without inducing swirls in the washing and drying process. I can typically complete the entire wheels/wash/dry/wax process in an hour (without engine cleaning). If you have any additional comments or questions, please submit your reply in the comment box below. Can I use the P21S TAW to clean the wheel wells and the exhaust tip? Also, does the TAW clean bugs and tar? Although there are more economical solutions for these areas (Megs All Purpose Cleaner Plus for instance), you can use TAW as well and it would work just fine. You can also use it for cleaning off bugs (apply to cool surface in the shade, don’t let it dry, and be careful if using this or any strong cleaner around oxidised plastic trim), but I would stick to Stoner’s Tarminator for tar removal. You say not to use too much pressure when washing, but how do you get all the bugs and really stuck on things off, especially around the bottom? For those items I will try to pre-soak them in APC or use a product like Poorboy’s Bug Squash to loosen them up as much as possible. If some of it remains after pre-soaking and washing, then I’ll spot-clay to remove. If you have to go this aggressive, you’ll want to re-apply your wax / sealant on those spots. When you use Chemical Guys Grime Reaper for the tires, do you dilute that with water and at what ratio? I usually dilute it about 5:1 water to cleaner. Honda paint is very soft. I love TL’s and besides exotic details, I do a lot of honda Products. Its nice to know a paint that good. My s2000 was berlina black and i did a lot of testing with it knowing it has soft. Don’t you kinda dislike the spray pattern with the hose nozzel when the foaming portion is disconnected? I kind of follow the same washing technique you use but instead of doing an initial wipe down at first to get the majority of water in the drying process, I just go ahead and spray a spray wax or quick detailer as I dry the vehicle using a waffle weave MF while rinsing the towel a couple times in a bucket of clean water with grit guard during the drying process. Do you think I am at risk of introducing swirls using the method I use? Well you’re using a very similar system to what I am, with the exception of rinsing the towel out in a bucket. I don’t see where it would add any risk of marring, but your towel surely isn’t soaking up as much water as it could. Using a QD or a spray wax during the drying process is a must as it adds needed lubrication to your drying towel. I usually see some fine grit on the bottom of the bucket after drying the vehicle even though I’ve thoroughly washed the vehicle. This is the main reason why I rinse/agitate the drying towel then wring out excess water away from the bucket and then proceed onto drying the vehicle again while spraying some QD. Thank you again for your kind reassurance. Thank you for such an extensive guide, you put a great deal of work into the guide, not to mention the car. Thanks Matthew! And yes, this was a marathon writing session to put this guide together! Just ordered the Foam Gun and from the reviews is not clear or easily understood the soap to water ratio. Do you just put soap in the container? or do you add water and soap? if so what is the ratio you recommend?…BTW, awesome write-up; I own a TL and will be doing a complete detail job…thanks for the pics too. Just add soap to the container and set your dial according to the recommended ratio by the car wash solution manufacturer. You only need to add water to the container if the lowest setting on the foam gun is too heavy for recommended mixing ratio. Todd, first of all, I want to say that all your articles are just wonderful and are a great help. I’ve seen in various articles that you go to the Gilmour Foammaster as your car wash tool. Is there any particular reason why you choose that tool over pressure washer and foam lance/cannon combination? Keep these great articles coming! I have a pressure washer, but quite frankly I don’t have much need for it since the cars I work on aren’t overly dirty. Any time savings I would have by using the pressure washer are offset by the extra time I have to take to set it up, drag it around, and unhook everything when I am done. The car in this article was much dirtier than what I am typically faced with and could have used it at that time. Great articles. I’m on this site learning something new almost every day. Question: P21S Total Auto Wash is a little pricey. Is there anything else that can be used prior to the actual car wash for emblem cleaning, inside the gas cap, grill cleaning etc that is a little more economical? I have Megs APC (green not the orange) – can I use that in place of TAW on the exterior/painted surfaces of the car for that type of work? If so, what’s a better dilution ratio: medium strength 10:1 or heavy strength 4:1. Keep the great informative articles coming. First off once again great write up. All the pictures and explaining are amazing and very well done. I have a Honda Civic 06 Galaxy Gray. Would you say that the type of paint that Acura uses on there TL will be used on the Honda and Acura models. The paint in two different factories can be different (and many times is different), but having said that, most of Hondas paints are very similar. For the most part, they’re all good to work with. Amazing write-up on NBP care and polishing. My question is: what would you say is the most economical way to own and care for an Acura with NBP without sacrificing the quality? I have an RDX. After learning in the online community there is no way I’m going to use the drive-through car wash, but do I really need to purchase $500 in product and tools? So far, I purchase the PC 7424xp. How you would advise a hobbyist proceed in the most cost efficient way? I’m willing to invest time and money, but I’d prefer to devise a high impact, low cost regime – assuming this is possible. Thanks! Thanks Phil. First and foremost, you need to make sure that your washing and drying techniques are absolutely solid! Use something like Chemical Guys V7 for your drying process as well as it will add lubrication to the drying towel and will provide a layer of protection at the same time. If you have a PC, then get yourself some black or blue pads, and a product like Chemical Guys Blacklight or Sonax Nano Tech Paint Cleaner. These are easy to use, will provide you with some light correction capability and protection at the same time. Even doing this process just a couple of times per year will make a big difference. it show how much dedicated you are as well as how you love the car. I LOVE the work that you did to this car. I’ve been studying it with any spare time that I may have, hoping that I can semi-replicate what you’ve done here. But I was wondering, for a person who knows how to get things clean, but doesn’t have much experience with buffing, do you think I’d be able to master the process? Also, I know that the buffers that are recommended are well out of my means (referring to $200 machines), and I’ve seen not-so-elaborate ones around for around $30 or $40. What do you recommend me getting? I have a 2007 TL same color as the one you’ve done work to here, and the paint is in about the same condition. Please help! Thank you Brooke. I wouldn’t recommend wasting your money on an inexpensive machine like that…you’ll achieve very little success with it. To answer your question, yes…you can replicate this level, but it’s not something that you could achieve your first or second time around. We provide specific tool and product recommendations along with our thought processes to achieve certain levels of correction to show everybody what can be done, and how we do it. Many first-timers will be inspired enough to start learning as much as possible, invest in tools and products, and slowly learn the process. It takes time to learn, but once you start to get the hang of it, it can become very addictive (and frustrating). If you’re willing to invest the money for tools and equipment, and then the time to learn paint correction, then I highly recommend it. Otherwise you can find a true paint correction specialist that can perform the work for you if you want to transform your TL into something that looks like this one. There is some great stuff here Todd, thanks so much.. I am wondering what kind of brush that is you are using to clean the grille and emblems? If you could point me somewhere that I can purchase one I’d appreciate it. You can get a good boar’s hair detailing brush right here on DI. I just purchased an Black Kia Soranto and play a lot in the snow (cross skiing, etc.). At the end of the day I drop enough in altitude to get out of the snow but I left with a VERY dirty car. The first thing I’m going to want to do is clean it.. My concern is how I deal with an extremely dirty car and not introduce swirls? You’ll want to get all the heavy stuff off of it before doing any washing, and that can be accomplished at home with a pressure washer if you have one, and if not, you could use the one at your local do-it-yourself car wash (just DO NOT use their brush!). At that point you can safely do a proper wash as needed at home. What is the concern with the DIY carwash brush? When I use the DIY place, I always rinse the brush with the high pressure hose before using it. So presumably, any pre-existing dirt is removed from the brush. So, is it the brush itself that you object to? Are the fibers in the brush too abrasive? Please educate me. I have an abyss blue pearl and it doesn’t have as many imperfection as this one you show but i was curious if you know any one in the minneapolis mn area that can do such a great job. yours was AMAZING! Thanks for the info, I recently purchased a 08′ NBP Type S and after reading this article I feel like I’ve been cleaning my old NBP Accord V6 Coupe all wrong (I was using Turtle Wax ICE products). My question is, what do you recommend for the carbon fiber inserts and the “black chrome” rims if I don’t yet have access to the products you used. Do you have any articles on seat care? Where would I find the products you used, by the way??? Thanks again!!! All of the products are available right here on Detailed Image! Just wanted to tell you that there’s a Google search box at the top of this page, or on the Blog home page that you can use to find any article you need….and yes, these guys have pretty much covered everything! Hey Paul T, Thanks… I registered on DI and I looked up quite a few of Todd’s articles, I feel like Neo when he first enters the real world in The Matrix. I’ve been detailing wrong all this time… LOL! Has the use of a leaf blower found it’s way into any of your car-drying workflows? I happen to use one to dry my large truck, and it saves a lot of time and towels. Today is the first time I’ve learned what detailing really means and am blown away at the awesomeness you guys achieve. I saw in one of DI’s articles the mention of a car being washed weekly. Would you please shed light on how frequently you do this whole wash/wax process? And you do the paint restore (Buff?) twice per year? I’m just curious about the upkeep one must apply to your gorgeous car after “babying” it as you effectively described in the article. Great Work, I detailed for an acura dealership for a year or so and I have done so many TL and TSX, The NBP paint is tricky but looks amazing after full correction. Love that you drive a Type S, been my favorite car for years. both to drive and detail.. I have a white car and I would like to know if the white color requires the same amount of maintenance as black? Where do you get your materials like buffer/polish pads for your tools? Sir, apart from these valuable guidance, i would request you to provide leads for buying these superb items, from where to buy may be the hit question among the readers, online links can be inserted. Does FW1 waterless product damages your paint? What are your thoughts about using a clear bra on a black car? So great post ! never found anything so complete ! Thank you for all, you are an expert ! Just curious to know what your thoughts are regarding paint sealant versus carnuba/synthetic wax? I ended up using wax only because here in Canada, wax is cheaper and more readily available to purchase at local stores compared to sealant. Eddie – Waxes will last around 3-4 weeks, but generally look “warmer” or “deeper” if that makes sense. Sealants will last 3-4 months and have more of a glossy, wet look to them. I personally love to use sealants, however you can not go wrong with either one! Thanks Reece! I had been reading how sealants last a lot longer than waxes. I think I will go and do some research on which brand of sealants to buy, unless you may have recommendations, I’d be open to suggestions. I personally love the Blackfire Wet Diamond All Finish Paint Protection or the Chemical Guys JetSeal. Both will generally last about 3-4 months as well. Thanks again, Reece. I’ll look into those sealants and get ready for springtime detail. Keep up the great work on the website! I’m in enthusiast/amateur and own one hyundai black car (now 6 years old) in India. see the beautiful explanations step by step. Gone through the entire explanations a number of times and never got tired to read it again..
1. I have tried a lot of so called auto care centres at my place/town and never was satisfied with any of them and every body says they are professionals but they are definetly not as per my observations. 2. I do take care of my car myself, and keep it very clean and is definetly a better looking car than many other black cars. 3. I stay in an apartment complex and the parking is shaded but not closed garage. 4. I definetly can’t use any type of polishing machine due to cost factor / lack of any professional training. And what ever I have to do, it has to be done by hand only. 5. Not all brands / products you suggested are available in India. H. Quick detail spray for regular maintenance. I. Any thing else I missed…. Will DI supply the requested products to India. Jayaram – Unfortunately Todd is no longer writing on the blog, but you can contact us (https://www.detailedimage.com/Contact/) and I will be happy to help answer your questions! 8 years later and this article is still fantastic. I have a 2005 Acura TL with NBP paint and I just spent 18 hours this past weekend completing a full detail with Todd’s recommended products. I grew tired of wasting my time trying to find the right combination of pads and polishes to use, that I just bit the bullet and followed Todd’s recommendations almost to the T. I cannot express how beautiful my paint looks now. It truly is like a mirror. Thanks Todd for taking the time to write this article. Hello, what can you tell me about steam cleaning ? Is it any good ? Thanks. Hey Look I know you get messages all day long about SEO the problem is it takes Months to see success and costs a lot of cash. How about something that works NOW, and costs less than a meal and can get you clients and sales right now. I want to say thank you for your time and great customer service.